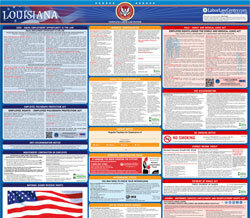 The Earned Income Credit (EIC) is a miscellaneous law poster by the Louisiana Office Of Human Resources. This is a mandatory posting for all employers in Louisiana, and businesses who fail to comply may be subject to fines or sanctions. This poster must be posted in a conspicuous place where all employees will see it. This poster describes how employees can get Earned Income Tax Credit (EIC). It appears you don't have a PDF plugin for this browser. Please see the link below to download louisiana-2014-earned-income-credit.pdf. Ever y employer shall keep conspicuously posted in or about the premises wherein any worker is employed, a printed copy or abstract of those labor laws which the Executive Director may designate, in a form to be furnished by the Executive Director. Tax Credits or Advance Earned Income Credits. or the Internal Revenue Service. (AEITC) became unavailable to workers. even if they owed no tax or did not get a refund. credit payable for a worker with one qualifying child. 1- 800 - 829 -1040 or visit the IRS Website at www.irs. article / 0,,id = 96406,00.html.